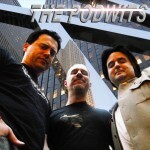 Lucas may have sold out to the Mouse House, but The Podwits are still independent originals! But that won’t stop us from jumping on the bandwagon of those discussing this earth-shaking media news! After all, we ARE Internet know-it-alls! J and Dion also take a look back at the show that was one of Joss Whedon’s most amazing (and underrated) masterpieces… “Firefly”! Look… Up In The Sky!